With every quadratic space φ over a field K one can associate in a functorial way a K-algebra C(φ) called the Clifford algebra of φ. 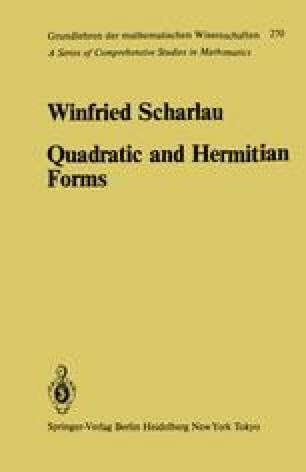 This construction is of fundamental importance in the algebraic theory of quadratic forms. In particular, the invariants e, d, c introduced in chapter 2 find a natural interpretation here. Many properties of these invariants are obvious in the context of Clifford algebras. Moreover, it is easy to include the case of characteristic 2.